News & Announcements, Workshops, Updates and much more! January 2012 International Image Competition is now open! ground running with a number of new features and content in store for our members. First off, check out the bright and shiny new format of our monthly newsletter. As you sip your morning latte or evening tea, we hope you enjoy flipping virtually through these magazine-style pages to peruse the latest happenings at NAPCP, explore our industry, and receive inspiration from your fellow members around the world. You’ll see that the January 2012 NAPCP International Image Competition opened this week, so keep in mind that a total of two Competition Credits are included with your NAPCP membership. Our beautiful and talented team of judges this time includes Karen Carey, Jennifer Hudson and Dana Pugh. Submit your entries today! branding and marketing guru—who will be answering your burning questions in a live Q&A session twice a week in a new forum section we call “Ask Jane!” Read on for more details, and be sure to take advantage of Jane’s practical advice and insight! Another shining star joins us this month, this time from the land down under. NAPCP member Barb “Jinky” Uil of JinkyArt is in the Spotlight. With portraiture described as “part fun, part curious”, Barb has a lovely and whimsical style that comes shining through in the interview. It’s easy to see why Barb’s gorgeous photography is admired well beyond her Canberra home and why she’s sharing her secrets to success and staying creative in a series of workshops around the world. So if flying to Australia to meet her is out of your budget, check out her upcoming sessions in select locations in the U.S., Canada, and Singapore. Still can’t get there? Barb has agreed to give away a copy of her valuable workbook to two lucky NAPCP members this month! we can connect this year, including February’s WPPI event in Las Vegas—so reach out to your fellow members if you’re going to be in town. Let’s start big, and make 2012 a huge year for all of us! WO R K S H O P S Barb Uil & Jinky Art Barb Uil of Jinky Art Photography will officially kick off her 2012 workshop tour in March! Stops along the way include France, Singapore, Ontario, British Columbia, as well as 8 stops in the U.S. (Washington, Florida, South Carolina, Arizona, Texas and Alabama). Donâ&#x20AC;&#x2122;t miss your opportunity to learn from one of the absolute best in the business! A Workshop Experience Presented by Dana Pugh & Ashley Skjaveland! Will be held May 4, 5, and 6th 2012 in Kelowna, BC. Join Dana and Ashley for discussions on creativity, inspiration, client experience, pricing, marketing, natural newborn posing and authentic family interactions! Ask Jane on the Forum It’s time to dig up all those burning questions you have about branding, marketing, social media strategies, and anything else related that might boggle your brain. We’ve set up a brand new category on the forum especially dedicated to this topic! Jane Johnson is our resident branding and marketing guru, and if you missed the Live Q&A event with Jane, do not fret! Jane will be answering all of your questions twice a week in as much detail as possible! Australian photographer Barb Uil in mind. Her unique style and her internationally admired portraiture has made her studio, JinkyArt, a recognized name in the child photography industry. This month we chat with Barb, as she reveals how her introduction to the business started much like many of ours—growing from a busy mom with a camera into a successful international business. Read on for a fascinating look into Barb’s world, and how she’s now reaching out to inspire other talented child photographers in workshops possibly in a location near you. Tell us your story. How you started and how your photography, brand, and business transformed over the last few years... I started out the same way so many did - taking photographs of my children. Prior to that I use to work as a child care worker, so blending the two things that I love - photography and children - really came naturally. Its for this reason, I think that I photograph from the perspective of a child, for the most part, and really my brand and photography have developed around that. However, I have to admit, I just love photography. I feel like the sun in shining any day that I am fortunate enough to pick up my camera. over the years I have developed ways of pulling myself out of it. However, at the end of the day, if my creativity is gone then I really feel amiss. If anything ever challenges me its that...to keep being creative. What is one business lesson you wish you learned a long time ago? That photography and business CAN go hand in hand. What is the best advice you have received regarding photography? Never take photographs for free, ever ever ever ever ever. I really believe in the importance of valuing ourselves as creatives. Our time is just as important as anyone elses. Your style is very unique and defined by the detail and thought that goes into every shoot. Can you tell us how you make it all work and what inspires the beautiful imagery in your work? Thank you! I am constantly pushing myself to create images that I hope my clients will treasure..forever and ever. Its never enough for me to go out to a shoot and think “That’ll do”. I really try and work with my clients and their vision. I think the moment that I feel like I can nail every single session is the moment I should put my camera down. I guess in a way I find comfort in knowing that I need to always push myself. What is your secret to capturing such magic in your subject’s worlds? Well, I guess I really believe in the innocents of childhood and try to capture that. workshops are aimed at finding yourself, pushing your creativity and becoming the photographer that you dream of becoming. Full details can be found at http://www.jinkyart.com.au/store What advice can you give to those starting out? Oh, so much! However, please value your time, and your talent. I recommend charging when your ready instead of under-charging. To see more of Barbâ&#x20AC;&#x2122;s work, please visit her site here, and her blog here! FEATURED VENDOR BARB UIL OF JINKYART A personal and inspirational guide and adventure into photographing your family and inviting time to breathe, time to love, and time to embrace what you have. An invitation to explore your creativity, whilst also recording the moments that your heart tells you that you must. Filled with 160 pages of love, ‘For The Love’ is for anyone who loves photography, as it is a gentle reminder that we need to slow down, record, and remember these precious days. 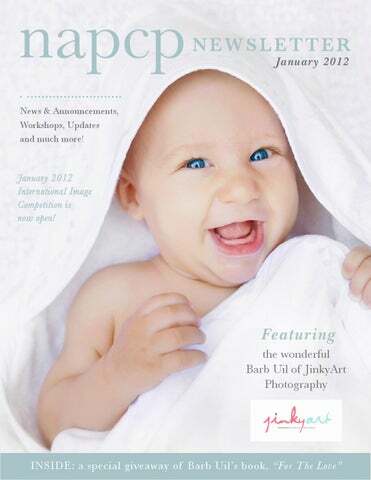 NAPCP January Newsletter: 2012! Featuring Barb Uil of JinkyArt!